The way in which Western societies produce and consume food now stands at the center of a massive ethical, ecological, and human health crisis. The industrialization of agriculture in the name of economic efficiency has increased the food supply, (temporarily) defying Malthusian expectations of global mass starvation, but it has also brought with it a series of unprecedented problems. Accordingly, the philosophical literature on questions relating to the ecology of agriculture has multiplied many times over in the last twenty years. Yet so far little consideration has been given to one of the only major historical philosophers to have dealt explicitly with the nature of agriculture – G.W.F. 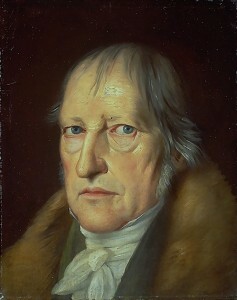 Hegel. The potential relevance of his thought to our current situation can be seen from his statement that ‘in our day, the [agricultural] economy is also conducted on methods devised by ref lective thinking, i.e. like a factory. This has given it a character like that of industry and contrary to its natural one.’ In this paper, I will argue that Hegel’s characterization of the logic of the ‘substantial estate’ of civil society constitutes a critique of early industrialized agriculture that is robust enough to provide us with the basic principles needed to address our contemporary crisis. This entry was posted in Philosophical and tagged Hegel, logic on 12/06/2018 by Mary.